There’s a little bit of magic that happens during the gray winter weeks that plants a seedling of hope for me. While August peaches, April apricots and September grapes are long gone, there is a glimmer of produce hope that crops up on shelves around this time of year. There’s a whole host of citrus that are in peak season and whispers promises of endless days in the sun and the sounds clicking ice cubes. Is there anything more beautiful to behold on a dreary winter day than a bowl brimming with lemons? And not just any lemons, but Meyer lemons. With their thin skin, sweet flesh, and floral fragrance, they are my favorite kind of lemons. Since last week was awash in cold damp rain, I decided to whip up a little bit of magic in my oven–a Meyer lemon cake dotted with poppy seeds and drenched in a citrus glaze. To balance the sweetness and acidity serve the cake with fresh whipped cream and blueberries or strawberries. 2. Butter an 8 1/2 by 4 1/4 by 2 1/2-inch loaf pan or a 9 1/2-inch Bundt cake pan. 3. Sift together the flour, baking powder, and salt into 1 bowl. 4. In another bowl, whisk together the yogurt, 3/4 cup sugar, the eggs, oil, lemon zest, 1 Tbsp lemon juice, and vanilla. 5. Slowly stir the dry ingredients into the wet ingredients, making sure it’s all incorporated. Fold in the poppyseeds. Pour the batter into the prepared pan and bake for about 50 minutes, or until a cake tester placed in the center of the loaf comes out clean. 6. Meanwhile, cook the 1/3 cup citrus juice and remaining 3 Tbsps sugar in a small pan until the sugar dissolves and the mixture begins to thicken slightly. Set aside. 7. When the cake is done, allow it to cool in the pan for 10 minutes before removing. Carefully place on a baking rack over a sheet pan. While the cake is still warm, pour the glaze over the cake and allow it to soak in. (Make tiny holes with a toothpick to draw the syrup in better). Cool before serving. 8. You can serve this with fresh whipped heavy cream and sliced strawberries. 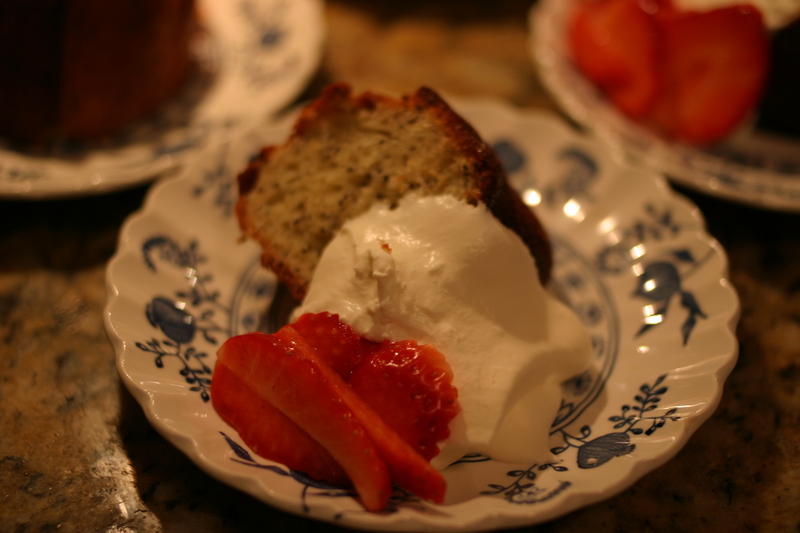 I adore poppy cake… must try this one! Have you seen the movie ‘Today’s Special’ yet? All takes place in Jackson Hts and about food… love it. No, I have not seen Aasif Mandvi’s Today’s Special, but it’s on my list. Thanks for visiting and reading. I love following the stories about your adventures with Ezra and Zoe. Thanks for the recent post about Scandinavian House. We had an amazing time there. I think we cross paths in the mornings at the corner of 79th and 37th. One of these days if I’m not rushing PDot to daycare, I’ll be the one with the glasses waving “Hello”.